If you are space geeks like we are, the 25 Weirdest Facts About The Solar System is a cool read. Found the Van Allen belts picture from NASA particularly interesting. 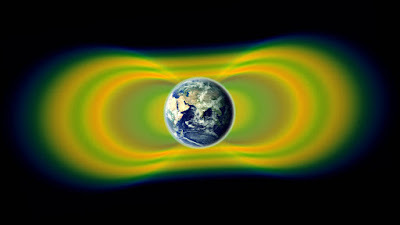 Earth has bands of radiation belts surrounding our planet, known as the Van Allen belts (named after the discoverer of this phenomenon.) While we've known about the belts since the dawn of the space age, the Van Allen Probes (launched in 2012) have provided our best-ever view of them. They've uncovered quite a few surprises along the way. We now know that the belts expand and contract according to solar activity. Sometimes the belts are very distinct, and sometimes they swell into one massive belt. An extra radiation belt (beyond the known two) was spotted in 2013. Understanding these belts helps scientists make better predictions about space weather, or solar storms.